Google wants to make all of its products accessible to everyone, no matter where they’re located or what Internet conditions they’re working with. For those of you who travel or aren’t located in the U.S., you know that Internet connection speeds can be slow in third-world countries. Shoot, even when you’re in a local Starbucks, things can be slow. Today, the company shipped two new features that allows you to tweak a slider to improve your experience based on your bandwidth capabilities. Up until now, Hangouts have tried to cooperate with your bandwidth to give you the best quality possible, but having this extra control will do wonders. 1) Audio-only mode. Choose this mode to send and receive audio only, and thus, significantly reduce your bandwidth requirements. Other participants will only see your profile picture, but they’ll hear you loud and clear. 2) Bandwidth slider. 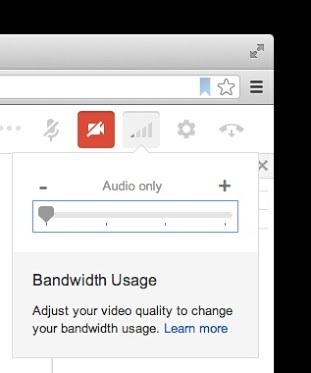 At the top right of every hangout is a new slider that lets you adjust your bandwidth preferences in real-time — from high, all the way to audio-only. This makes it easier to keep hangouts going, even in areas with poor connectivity. Both of these features are coming your way today but they’re rolling out separately so you may see one before you see the other. Very soon both features will be available to everyone, so give ’em a try and let us know what you think! Thanks for your patience. By adding audio-only mode, anyone can participate in a Hangout conversation, business or otherwise, no matter where they are. Hangouts can be tough on mobile devices if you’re not in the best of signal conditions. Audio can speed through to you quickly, though. Sadly, these features aren’t available away from the desktop as of yet, which one can hope will change soon. For many people who haven’t dug into Google+ as of yet, Hangouts has been a feature that a lot of people have participated in whether they knew it or not. With Hangouts on Air, you can view recorded conversations that were put together in seconds. Last month, Vice President Joe Biden participated in one such Hangout, which drew a lot of viewers after the fact. Speaking of making its products available everywhere, Google also launched Hangouts in India yesterday, and if you think about how strong Google is with translation software, you can imagine a world where one day you’ll be able to do a Hangout with someone who doesn’t speak your language and have the conversation seamlessly translated for you on the fly.